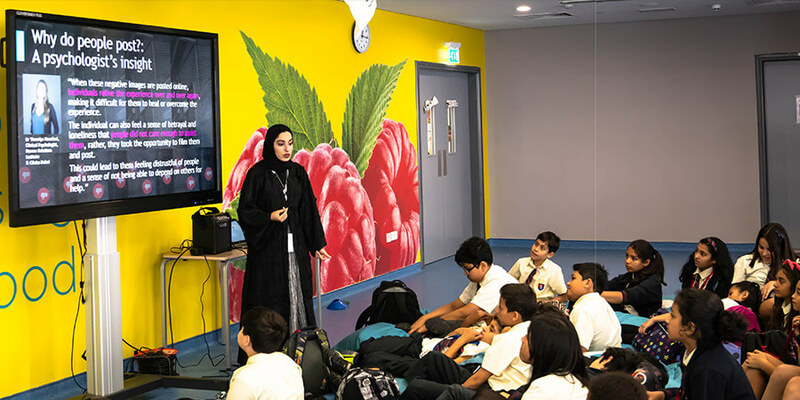 du, from Emirates Integrated Telecommunications Company (EITC), continued to engage UAE youth in inspiring conversations about responsible social media behaviour during its recent visits to the Indian High School in Dubai and GEMS Founders School. The Public Service Announcement (PSA) campaign follows the theme, "If it were your pain, would you share it?" to raise awareness and inspire conversations around conscientious and ethical social media usage. Abdulwahed Juma, Executive Vice President of Brand and Corporate Communications at du, spoke to 350 year-nine boys at the Indian High School about the importance of mindfulness when posting online. He also discussed the research findings that spurred the #PostWisely campaign. "It was a pleasure to have had the opportunity to share the motivation behind #PostWisely and inspire an audience of attentive and engaged young students," said Juma. "At du, we believe we have a role to play in championing the social causes we are passionate about. Our aim is to engage the UAE community at a grassroots level. We are doing this by visiting schools and universities throughout the country." du representatives have also recently discussed an array of topics, including #PostWisely, with 60 students at GEMS Founders School. The telco has visited a total of three educational facilities since the launch of the second phase of #PostWisely in February, including the American University of Sharjah in March.